We make Kitty from our home in Goolwa, a seaside town just south of Adelaide in South Australia. We love working together, designing and making, and we're proud to be able to produce something good that puts so many smiles on the faces of our customers. American Secretary of State Hilary Clinton said, 'Adelaide is one of the great, critical industrial centers in the world', and Team Kitty likes to think, if somewhat tongue in cheek, that Hilary means us, faffing about on our two industrial Pfaff sewing machines! Hey, it's great that something still gets made in Australia! 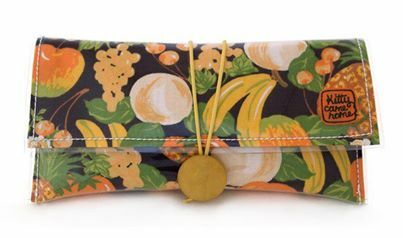 We make pretty purses (and wallets and sleeves and journals and more) and pretty is critically important, if it puts a smile on your face. And we love good design, which means we design for functionality and durability too. Most important is that each item is unique. That's the joy of being truly handmade - no two fabric items are ever identical, yours is 'yours' to express yourself with and to enjoy! Team Kitty: fabric, fur and purrs!